Sam and pal Peter’s final onslaught on the Turks – through the medium of song; then, after month of lousy food, Sam’s summoned to Brigade HQ and finds himself luxuriating on steak and onions! A hundred years ago this week… apart from a big artillery exchange along the Western Front on November 30 (to no particular purpose it seems), lower levels of attrition took over for the winter. Likewise on the Eastern, although in Latvia the Russian Army had further success at Illuskt (November 29), but they were “repulsed” by the Germans at Dvinsk and Lake Babit (December 5). Further south, two costly conflicts ceased. The 4th Battle Of The Isonzo ended inconclusively (December 2), exhausted by the severity of both casualties and the weather after a climactic battle at Tolmin (now in Slovenia) – since November 10 Italian casualties had totalled 49,500, Austro-Hungarian 32,100. And the relentless invasion of Serbia by German, Austro-Hungarian and Bulgarian forces concluded (December 4) with the Serbian Army driven out through Albania, the survivors shipped across to Corfu (they suffered 30,000 casualties, their foes’ being described as “light”). Accordingly, the French Army supporting the Serbs pulled back into Greek Salonika (December 2) where fresh British troops joined them (December 4). Last week, my father was still in that Suvla hilltop Signalling post/hole, working his two-man, 24-hours-a-day, seven-days-a-week rotation of duty and sleep. In the wake of the Gallipoli blizzard/floods, with no water available from HQ, he revealed the blasé bravado which, in the battlefield, can overcome the cautious inhibitions of the most circumspect character – which he had generally been through childhood and early teens – when he dodged sniper bullets to fetch buckets of snow from a neighbouring trench. Then he experienced the horror of realising he had, inadvertently, led a lad even younger than himself to his death; the boy dashed for water without emulating Sam’s stop-start tricks and took an almost certainly fatal shot through a lung. ‘Returning confidence due to better feeding, certainty that the campaign was fizzling out, and the buoyant nature of my newly arrived mate, resulted in moments I could only describe as merry. When the Navy suddenly opened up a noisy bombardment of Turk positions one day, Nieter and I actually cheered and sang A Life On The Ocean Waves. Another time, we two idiots decided to serenade the enemy by tum-te-tumming a tune favoured by brass bands at that time entitled The Turkish Patrol. The barmy thing about this effort was our pretended assumption that the Turks would recognise the tune because of its title. I had been feeling that the small number of people of my Battalion who still remained after the blizzard* must have forgotten my existence, but a week or so after Nieter’s arrival I had pleasant proof that this was not so. A replacement for me suddenly appeared at our hole on the hilltop and I received instructions to join the Signals Section at 88th Brigade Headquarters until further orders. Thankfully, it was dry, but it was sited beside the junction of two footpaths, and I quickly discovered that the position had been honoured by an enemy sniper. He had one of those tripod-rifles fixed on the point where the paths met; at intervals, a bullet smacked into the ground about a foot from one end of my hole**. As the new boy, the privilege of avoiding sudden death by a sniper’s bullet automatically became mine. But the pleasure of working in a warm, covered structure, properly seated, with cooked food and big helpings of hot tea, more than compensated for the sniper targeting my sleeping quarters. ‘Well into December, the weather generally remained pleasant. That awful blizzard now seemed like a sad dream although I had my funny-feeling feet and brown toenails to remind me – as did the stories recounted by survivors who had fared much worse than I. A sight I’d missed in my rather isolated position on the machine-gun hill was large numbers of men in various stages of illness, many with layers of socks and rags over their frost-bitten feet, heading hopefully for the beach. How could such a suffering multitude be dealt with properly? The beach people must also have been rained on, then snowed on, then frozen and tortured by that Siberian blast if they dared to venture into the open. Then the sorry throng, with their frostbitten feet and hands, some already gangrenous, all of them short of food, descended on them and they just had to cope. What a commandeering of lighters and small steamboats there must have been. I, with my two biscuits and a handful of tea***, had seen almost nothing of these larger events. Suddenly, my brief, beautiful life at HQ ended with an order to rejoin Nieter on the hill; his helper – my substitute – had gone down with a high temperature and no one else could be found to replace him. Before I left the kindly men at 88th Brigade Signals, they gave me bread, some cold meat, bacon and a useful bag of tea. This eased my return to the more Spartan existence up above and ensured a warm welcome from my sturdy Swiss Cockney. 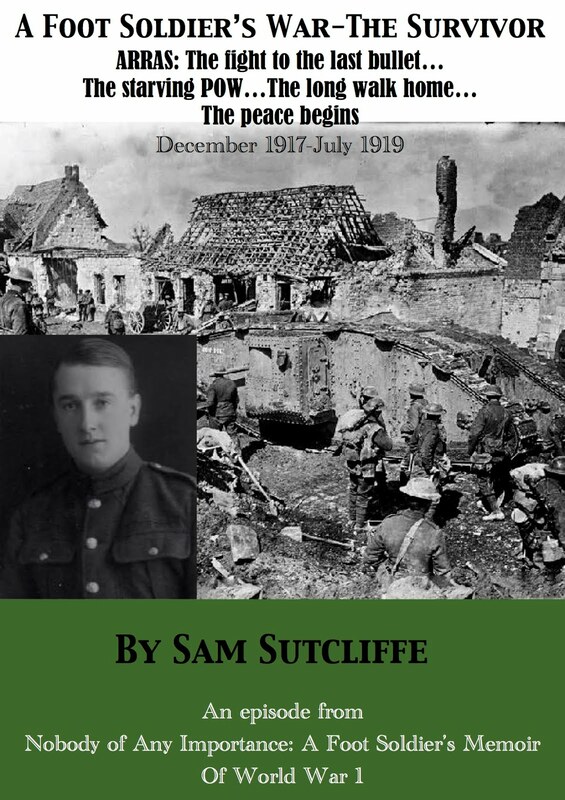 I found anyway that he had not fared too badly, having been authorised to draw rations from the resourceful regulars of the 2nd Battalion Essex Regiment. I also took back to Nieter a rumour, whispered to me as I left Brigade HQ, suggesting that our days on that foreign shore were numbered. The promise of release from our deprivation and danger, so useless, so purposeless, cheered us up considerably. Messages of instruction to various Companies around us passed through our hands and these confirmed our opinion that the end of the failed campaign drew near. Groups of men quietly withdrew, and those remaining had instructions to appear busy and show themselves more – but with reasonable care – to enemy observers. I heard that members of the Engineers Corps were working in the forward trenches, fixing fuses connected to detonators along the parapets. * One list of casualties for the original 1000-strong Battalion at the end of November shows 22 killed, 57 wounded, 445 sick (mainly dysentery, jaundice and frostbite). 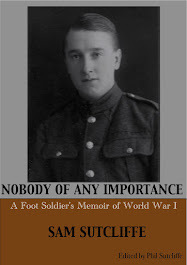 My father several times wrote that by the time they finally evacuated from Gallipoli they were down to 200 men or fewer. ** For a fuller explanation of the Turkish tripod snipers methods see Blog 66 11/10/15. *** See Blog 71 15/11/15 for the story of how he’d had to beg these provisions “to feed two men for an indefinite period”. A hundred years ago this week… maybe the kind of phase that originated that not irony-free phrase “all quiet on the Western Front”. The summaries note only a German Army attack north of Artois repulsed (November 27) – not to say that men weren’t dying daily on both sides. In the East, the Russian Army continued its winter turnaround with a series of victories over the German at Tzaremunde (Latvia, 23), Yanopol (Ukraine, 24) and Pinsk (Belarus, 28). They succeeded much further south too, defeating Turkish and Kurdish forces at Karaj and Yengi Iman in Persia (26). The 4th Battle Of The Isonzo between Italy and Austria continued, but the Italian Army took Rovereto (in Trentino, 23) from Austria – which promptly called for German assistance. But the greatest events took place in less-remembered parts of the conflict. On November 25, the Serbian Army, assailed by a combination of Bulgarian, German and Austro-Hungarian Regiments since October 7, finally cracked and fled in full retreat through Albania, sustaining terrible casualties because of the weather more than the fighting – the Siberian blizzard that swept Gallipoli afflicted the Balkans too. And in Mesopotamia (Iraq), after a series of British Indian Army victories over the Ottoman along the Tigris, a sudden reversal saw the previously disregarded Colonel Nureddin lead his men to hold back a fresh attack at Ctesiphon, 16 miles south-east of Baghdad and then chase their foes 100 miles back to Kut. 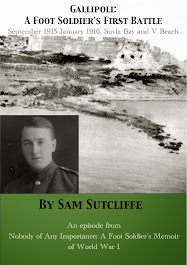 Last week, in his Memoir my father wrote about his own experience of the great Gallipoli blizzard of late November, 1915 (in the rhythm of the Memoir I had to start covering it a week early); venturing down from his two-man 24-hour hilltop Signals post to seek food from Battalion HQ when he and gloomy colleague Harry Green “looked like dying quite soon”; discovering his 2/1st comrades huddled together in the open –forced out of their trenches by floods of melted snow and. ‘My feet felt uncomfortable, but I didn’t remove my boots then, nor for a week or more afterwards. Later, back in Egypt, my already brown toenails turned gradually darker and at intervals fell out, but sound new ones grew in their place. ‘The sun shone briefly most days, growing warmth dried out our heavy coats, and life became far more bearable to me. Especially because my new companion on the hill turned out to be that shortish man of Swiss origin I have previously described**, he who was more patriotic than most British-born soldiers – and after all our tribulations, he still felt the same about his dad’s adopted country. He even made excuses for the failed author/poet who had, by some accident, become the Commander-in-Chief of that unfortunate Army*** and composed lyrical dispatches for home consumption in his comfortable cabin way out at sea. After that wasteful Ramadan**** bombardment I had no further fears that the enemy would ever launch a big attack on us, and now I felt convinced that our depleted force would never have a go at him… so all one had to do was be careful to stay alive, until someone told us to get the hell out of the wretched place. Attached once more to the regular Essex***** boys for rations, we fared well. And I had my disused trench for water – it remained several feet deep for some time. However, fetching it became risky because a sniper had spotted my movements as I darted hither and thither to fox his aim. * Strong For Service, H Montgomery Hyde’s biography of the 2/1st’s then commanding officer Major Harry Nathan (later a lord and an Attlee Government Minister) says 280 men “drowned” in the mud produced by thawing snow and rain at Gallipoli. ** Peter Nieter from my father’s trainee Signallers group on Malta (see blog 45, 17-05-15) – except that, first time round, he called him “Miter”; given my father’s fondness for aliases, I don’t know whether either version of the name is “real”. *** He means General Sir Ian Hamilton. **** HQ informed British troops that Ramadan triggered this bombardment and my father had no reason to know otherwise, but it was entirely the wrong time of year, as noted in blog 70, 8-11-15. 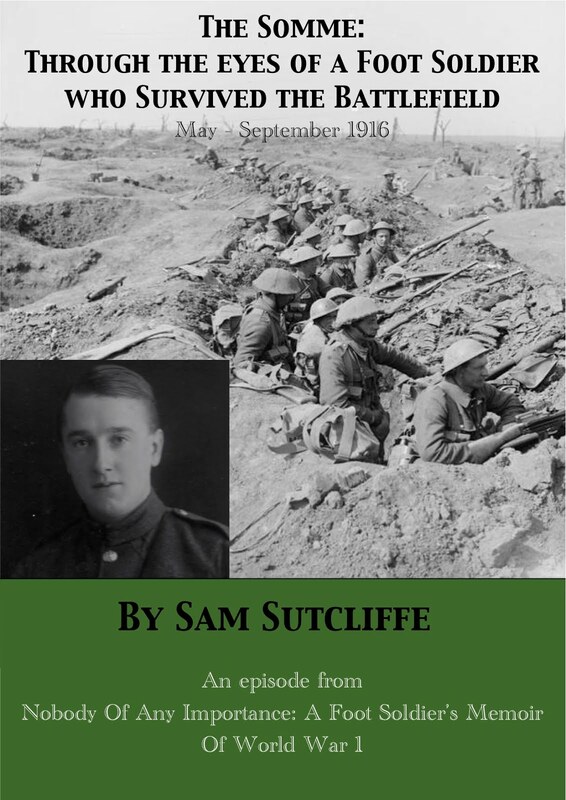 ***** The Essex Regiment machine-gun team they shared the hilltop with. Next week: Sam and Peter’s final onslaught on the Turks – through the medium of song; Sam, suddenly summoned to Divisional HQ, finds himself luxuriating on steak and onions for a few days! And the hilltop Signalling duo get a surprise, eccentric visit from General Beauvoir De Lisle himself!